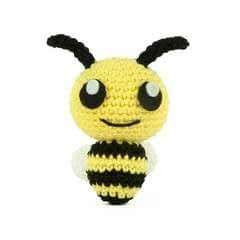 This lightweight blanket would be an ideal gift for a summer baby. The pattern is based on both lace and ribbed motifs. Don’t be alarmed if it seems rather narrow when you’re knitting. Blocking will stretch and smooth the blanket, revealing its lacy pattern. Even blocked, however, it remains stretchy, a plus when you’re wrapping it around the baby. © 2019 Judith Durant / Storey · Reproduced with permission. · Excerpted from One-Skein Wonders for Babies (c) Judith Durant. Photography by (c) Geneve Hoffman Photography. Charts by (c) Edie Eckman. Used with permission of Storey Publishing. ••Cast on 94 stitches. Work in Seed Stitch for 11/4"/3 cm, ending with a WS row. 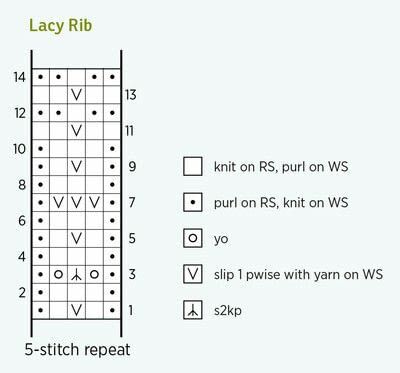 •• Row 1: Work in Seed Stitch as established over 7 stitches, pm, work Row 1 of Lacy Rib to last 7 stitches, pm, work in Seed Stitch as established to end of row. 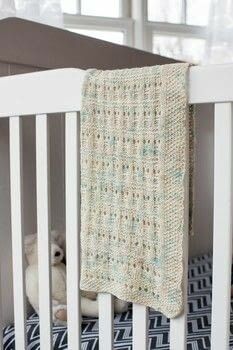 ••Maintaining the 7-stitch Seed Stitch border on each edge, continue in Lacy Rib Stitch pattern until 15 full repeats are complete, then work Rows 1–4 once more. ••Work in Seed Stitch for 11/4"/3 cm. Bind off loosely in pattern. ••Weave in any loose ends. ••Wet block, preferably using blocking wires. Row 1: *K1, p1; repeat from to end of row. Repeat Row 1 for pattern. Row 1 (RS): *P1, k1, slip 1 wyib, k1, p1; repeat from * to end of row. Row 2: *K1, p3, k1; repeat from * to end of row. Row 3: *P1, yo, s2kp, yo, p1; repeat from * to end of row. 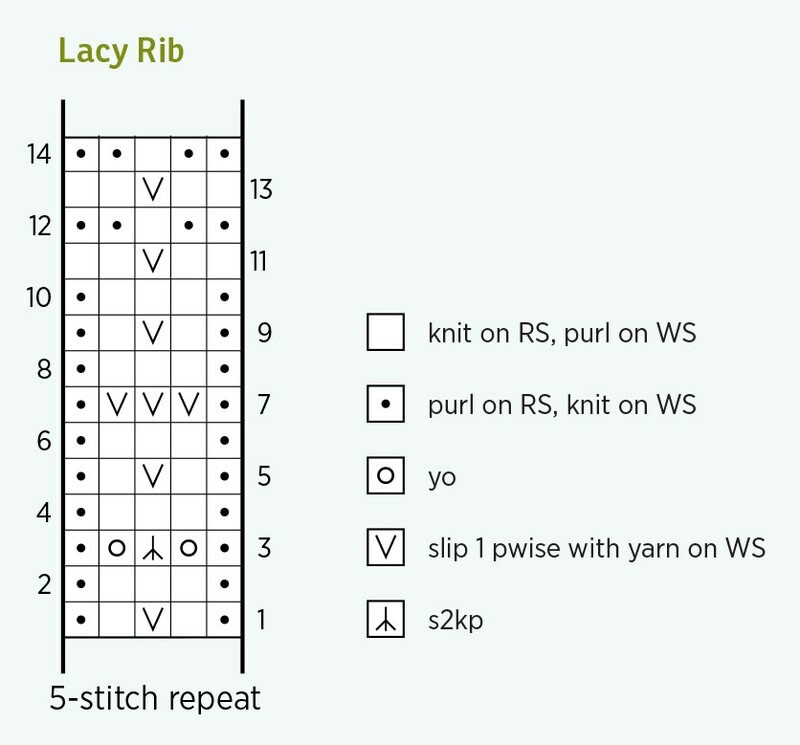 Row 7: *P1, slip 3 wyib, p1; repeat from * to end of row. Row 11: *K2, slip 1 wyib, k2; repeat from * to end of row. Row 12: *K2, p1, k2; repeat from * to end of row. Row 14: Repeat Row 12. Repeat Rows 1–14 for pattern.